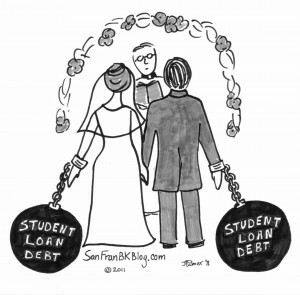 One of the new problems for couples to consider before marriage concerns the much-larger student debt that is now common. Don’t assume that if you are heavily indebted and marry someone who has high earnings that your partner will be responsible for any of your debt if you divorce; this is a new topic that needs to be addressed by your prenup if you want to understand what will happen and agree on a fair division of responsibility before marriage. In many states, divorce courts have the discretion to divide marital property in a holistic way. That means that if the educational debt is considered marital property, they have the option of taking into account contextual issues, such as each spouse’s ability to pay it off, Ms. Carbone says. So while student loans generally will go to the person who incurred them, there may be exceptions, she says. For example, if it seems like one spouse will have high income after a divorce and another will struggle to make debt payments, the higher earner may end up having to fork over some temporary spousal support to cover the ex’s debt payments. But debt division is complicated and can vary, depending on whether the state applies equitable-distribution, community-property or marital-property rules, Ms. Carbone says. As such, student loans in some circumstances could be split down the middle, even if one spouse has a much different financial situation than the other after divorce. In a related issue, in a few jurisdictions such as New York, a professional degree earned during the marriage can be considered marital property, says Rachel Rebouché, an associate professor who teaches family law at Temple University Beasley School of Law. That can lead to situations where the degree earner has to compensate a spouse for supporting his or her educational pursuits. Support for a spouse could mean time spent cooking meals, driving the degree earner to campus or even the supporter delaying his or her own educational pursuits, Ms. Rebouché says. In some cases, courts have awarded more property to the supporter to offset the value of a partner’s degree, she says. Those in the field say couples can take two basic steps to avoid surprises related to college debt. First: Get a prenuptial agreement and make sure it clearly specifies how you and your partner want to allocate any student debt accrued during a marriage in a divorce, says Naomi Cahn, a professor who researches family law at George Washington University. Second: Ask a partner about the extent of his or her debt and be honest about yours. When discussing finances, couples tend to “focus so much on the assets, but they forget that there’s often a lot of debt,” Ms. Cahn says.